We camped in Wichita on the way and the Ozarks on the way back, getting to both sites after dark and having to set up with our headlights, which was a nice way to slow down and interact with nature. Setting up a tent in the daylight can be hilarious and at night even more so but quite beautiful. We spent three nights in Kansas City and walked to the Nelson Atkins Museum each night because we loved the semi-dark sculpture garden. Seeing a giant, spotlit Claes Oldenburg Shuttlecock (badminton thingy) at night is something to see. I ended up designing a museum in my head around the idea of seeing art in all kinds of light and non-light. When the moon fully covered the sun, the sky turned colors I’ve never seen and stars came out on the horizons. I looked at my husband and our pup who were absorbing the colors beautifully and I committed that joyful image to memory. I looked at the people around me who were clapping, cheering, and taking pictures and I felt excited that we all shared this same desire to come see something bigger than ourselves. Then I looked back up at the spectacle for the last couple of minutes and felt quite calm; there was more space behind my eyes. I was sighing, laughing, and tearing up. Then, as if on cue, we all put our glasses back on and someone started playing “Fly me to the Moon” by Frank Sinatra. Old: A crystal/rock that my friend Amanda gave me a few years ago - it was calling me this month. Old: Vintage porcelain jars that we found on our road trip. They have a weird glowing moon glaze pattern to them. In Kansas last week I almost stepped on a turtle when I got out of the car to photograph a hay field. Then I got all frenzied and high-kneed it back to the car. We drove through Manhattan, Kansas so we could see the house that I grew up in. They call it the Little Apple. It’s where I discovered jump roping. My husband took a video of me jump roping in the exact spot on the driveway that I used to spend hours at with my rope. We sent it to my dad. It was pretty awesome. The house looked almost exactly the same. I went to the backyard to see where I used to have my fort with an awesome kitchen in it (a wood cutting board, a green bucket, and twigs that I made utensils out of). Then I paused to look at where our hammock used to sway with mulberry stains all over it. I went to get a foot reflexology massage that also had acupressure upper body for the first time. It was intense. I laid there trying to focus on stuff to let go of. I made a new friend this month. Wes Neal from Kansas City. He owns the Boulevard Drive- In. He started working there at 25 and bought it when he was around 50. He is turning 90 on Nov. 9, but I would have guessed 73. He eats a corn dog with mustard every Friday, Saturday, and Sunday. He lost his wife Mazie two years ago after a 10 year battle with cancer and told me he’s all alone now even though he has three children. I begged to differ since he had the drive-in regulars. I asked him lots of questions and he happily answered with a tooth pick in his mouth. In the middle of our conversation he asked if I could pick him out of his high school basketball team photo that hung near the refreshments. I did! It made him smile. Movie: "Dunkirk" blew my mind. Hardy’s eyes and the whole land, sea, and air dance. We may have seen it last month but I am still sitting with it. 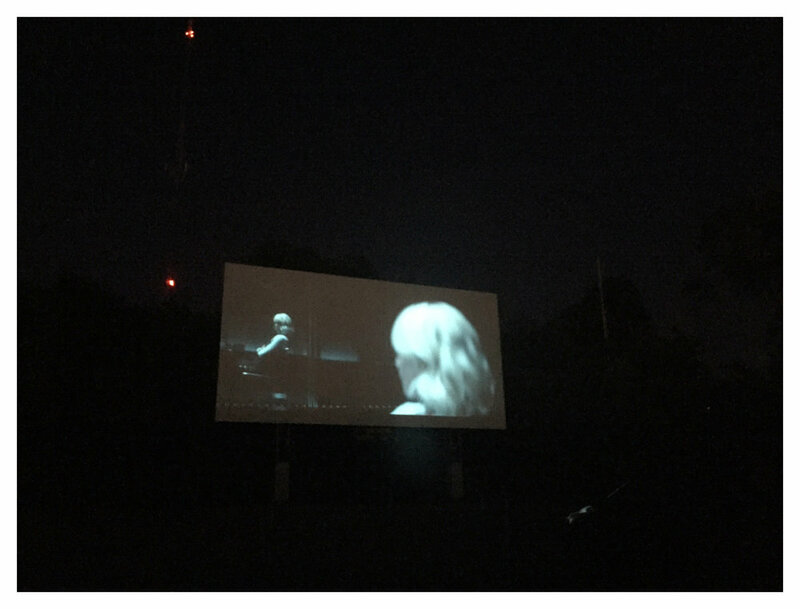 Also, we saw "Atomic Blonde" at the Drive-In which was so fun! We had the saltiest popcorn on the planet and some root beer. We got to enjoy it all with our pup in the backseat. It’s really a special way to see a movie. We finished "Ozark." I love Jason Bateman. When he flicks a caterpillar off a chair mid-sentence without skipping a beat I smiled inside. I am listening to "Fate and Furies." It's kept me wide awake while driving. I also read about a new art book: "Joseph Albers in Mexico" that I am excited about. I’ve been sun-steeping vinegar with herbs, seaweed, and flowers. I’m using it as a hair rinse. I think it’s pretty good. It’s also interesting to drink if you mix it with bubbly. Total eclipse: the glowing ring!